While I've had some exposure in my life to the inadequacies of the english language, it is confirmed for me this week that words can never match the depth of feeling our souls experience in times of great joy and great sorrow. The phrases, "words can't describe" or "there aren't words” can be seen as lack of trying. That is, until you have been there, reaching for words that don’t exist. Great blessings and great trials stir up the recesses of our souls, making us experience something new, something quite inexpressible: the singular moment when you know what you must do next, after weeks of confusion and indecision; the sparkle of love and utter trust in your child’s eyes while you tickle him into the hiccups; the awe and reverence I myself have felt this week witnessing my friends, Jori and Dwight Udall, maneuver through the darkest nightmare with light and love, taking every opportunity to testify that they know they will be with their son again, and that he is now whole and well, calming and reassuring family, friends, and the community at large. What strength of spirit this generosity requires, I can only imagine. Heaven knows, I would be tucked away in a private corner, crumpled in on myself. I am incredibly moved. And grateful to call them friends. More information in this previous post. And at CJUdall.org. My dear, dear friend's 11-year-old son unexpectedly passed away this weekend in a tragic accident. It has been a tender and uplifting experience for our family and our church. I am honored to witness such strength of faith up close. Jori and Dwight have endured more than anyone I've ever met. And must endure this as well. They are my heroes. Jori asked Isaac to create a website where CJ can be honored and where more info is posted. His family would like to celebrate his life by championing meaningful projects to benefit CJ's favorite things, including Boy Scouts, the Special Olympics and more. If you would like to know more about this special boy and help his family channel their tremendous grief in this positive direction with a donation to CJ's fund, please visit www.CJUdall.org. There was a press conference this afternoon, so more info will likely be on the AZ evening news tonight as well. Please spread the word. We can pull together and make a difference. My giveaway plans were derailed today by a very important little person and his very own 2nd birthday. Little Evan is two years old today! When I giddily plucked him from his crib this morning, we snuggled up on Charlotte's bed while I sang him a Happy Birthday song. At the end of every phrase, Evan chimed in with "cake!" Happy Birthday to you...cake!...Happy Birthday to you...cake!... Happy Birthday dear Evan...cake!...Happy Birthday to you...cake! It took us till eveningtime to finally make good on the promise of cake with a small family birthday party. Boisterous cousins followed Evan about, patting his head and picking him up in turn. By the time cake was served, Evan couldn't care less about the stir of children throughout our home. Cake, at last—what a birthday is all about. I wanted to write Evan a little love note today to enumerate his sweet particularities at this age, count the many ways in which I love him. But, Sundays are my busiest days—even without a birthday to celebrate. As such, the love note didn't happen. And today's giveaway post didn't happen either. When it came down to it, I had to choose between photographing and writing a giveaway post and giving my little son his birthday dues—time, attention and cake. I chose the baby. I could prep and post today's giveaway now, but it's getting too late in the night to do our awesome Day 25 prize justice. Instead, I'm going to go for a double header tomorrow and put up two separate giveaways in two separate posts. Hang tight and watch for those tomorrow. I'll make sure the deadlines are generous so you won't miss your chance. Virginia. Is this place for Real? It's great to be back home, but a bit of my heart and a large portion of my imagination are lingering behind in Virginia. For the middle-part of our big summer vacation, we drove south from D.C. to Colonial Williamsburg, with a stop at Thomas Jefferson's Monticello on the way. If I could live my dream life, I would garden and keep animals on a lush green farm at the edge of a big city. I would spin yarn and churn butter, cultivate the perfect cabbage, and make cheese. However, I would also wear glamorous dresses to the theater, learn portraiture at an art atelier in the city, take the light rail to business meetings, and type away on my top-of-the-line computer. All with my kids in tow. My life isn't too far off of this dream in spirit. I grow fruit trees and make art. And my kids are here with me. But the lush trees and rolling hills are missing. This is where Virginia comes in. My. Freakin'. Word. Pardon the language. Virginia is gorgeous. I almost had to close my eyes on the way to Monticello in order to survive the view: white fences, electric green grass, trees as big as buildings. Perhaps Providence will plop the perfect excuse in my lap to move somewhere lush and lovely and near a fun city. How about a Kickstarter campaign to build a blogger's getaway paradise with fully-teched-out guest cabins. Or a reality tv show about trying to make such a disjointed reality work. Have it all. Be it all. But I need a town to pin this fantasy to. What are the best little beautiful places to raise children, with great schools, strong, moral families and exciting things an arm's length away. And don't forget the large plots of land, big trees and cute houses. Give my dream new breath. If you relate, then you'd love Colonial Williamsburg. They run the town like it never left the 1700s, wigmakers, shoemakers, blacksmiths, cabinet-makers and all. I can't say enough about the place. There's' nothing like it out west, that's for sure. The gardens are immaculate and the buildings are charming—and I'm all about the workshops. I don't blog about them much, but I have a spinning wheel and a jeweler's bench of my own. I've built shoes, churned butter, made yogurt, turned pottery, made lampwork glass beads, and worked on a horse ranch. My inner pilgrim. I feel so disloyal to Arizona right now. Sorry, Arizona. I still love you—and your sun-bleached cow skulls and scorpions—but where are your towering trees and brick buildings? Where are your moss-covered walls and magnolias? Tell me it was a hallucination. Virginia is not real. We did it. We really did it. We took a much needed break and had two wonderful weeks touring Washington D.C., Williamsburg, and New York City with the kids and visiting east-coast family—Isaac's sisters, Evie and Laura both live near D.C. with their families and his brother Ross lives near N.Y.C. It was a trip like none other we've had to date. I came home home this week refreshed and inspired. In D.C. alone, we saw: The Natural History Museum, The Library of Congress (incredible! ), The National Portrait Gallery (I'm finally ready to try my hand at portraiture), The Lincoln Memorial, several war memorials (speechless), The American History Museum, The Steven F. Udvar-Hazy Air and Space Museum (my baby's heaven), and a had a private tour of The U.S. Capitol Building (my office manager, Karen's son works for our AZ congressman). I posted highlights from the trip on Instagram as we went along. There is so much more that wasn't posted. This collage shows some highlights from the DC portion of our trip. My iPhone alone has 1000+ photos from the trip, so choosing was tough. Some of you have asked for our itinerary to help plan future vacations to the area. I'll type that up and post it for you this week. Can I just say that D.C. was so much more magnificent and visually powerful than I expected. I was proud to see such beautiful architecture and art on display. I was especially taken by The Library of Congress and The National Portrait Gallery. I wasn't so sure about the massiveness of some of the government institutions. That was shocking. But, all in all, wow. What a fun afternoon. Fun I have no business having. Fun I have no business without. I was up with the baby till 4am last night, nursing him through a 105º fever. I finally climbed into the tub and poured water over his back while he slept against my shoulder. It was so sweet. But, man am I tired! It's 7pm now on Friday night and it feels like my day is just getting going. I don't think date night is gonna happen unless Isaac wants to help refine pattern covers, book flights, schedule meetings, or sew. It's time to hand out some show tickets and a C.D. Angela — you've got it — two tickets for Thursday night's show are all yours. Thank you for your enthusiasm. That always wins points with me—ask my kids. And — surprise — Rachel, we have two tickets for Friday night's show for you as well. I'm going to send Wendy your email addresses and she will send you the details. If you don't hear from her right away, email me your contact info. By random drawing, the C.D. goes to... Elizabeth S. Email me your shipping address, Elizabeth, and we'll drop your present in the mail right away—along with a few HB extras (!!!). As we wished—yay!—Wendy is game to offer two tickets to her show in New York City next week at The Metropolitan Room, featuring songs by composers as diverse as Cole Porter, Joni Mitchell, and Wendy’s collaborator, Michele Brourman. This exciting event celebrates Wendy’s debut album, Breathing, and is tied together with entertaining vignettes from Wendy’s colorful family—a fun and personal show. Wendy is my fiercely-fabulous sister-in-law. She is both a talented singer and a charming storyteller. She’s hilarious, in fact. ...And it’s killing me that we missed her opening night last week in Los Angeles! Anyone want to go to the New York show in my stead? I’ll sit on your lap in spirit. Wendy performs on Thursday, the 21st and on Friday, the 22nd at 7pm. I have TWO tickets to give away—and a C.D. Comment to enter. Please indicate in your comment if you want to be entered into the TICKETS drawing; otherwise, I'll assume you're in it for the C.D. If you're in the greater New York area and you don’t win the tickets giveaway, head to The Metropolitan Room for a exceptional show nevertheless! You’re sure to have a great night. And the cover charge is only $20. One more time, that’s The Metropolitan Room at 34 West 22nd Street (between 5th and 6th Avenues) in New York City. Reservations can be called in at (212) 206-0440 or made online at metropolitanroom.com. Discover more about the show here, and stop by Wendy’s blog at WendyLaneBailey.com. Update: Winners announced — click here. We just returned from a week in Los Angeles. My super-talented sister-in-law, Wendy Lane Bailey, had flown out to L.A. to perform at the Gardenia. We were supposed to arrive in time to watch her sing, but our van's new transmission had a different plan. Even though the transmission was only a couple of months old, it gave out on our way out of town—big time. Needless to say, we started out on a different adventure than we had planned. I'll just say that we got to know the truck stop really well. And after a few hours we made our way to a pizza place near the mechanic’s, camping there for most of the evening until we had secured a rental van to pile into. Nine hours and $700 later, we were back on the road to L.A. Unfortunately, we missed Wendy’s performance. A serious bummer. But, we tried to make up for it once we arrived. We stayed in a beautiful hotel in old-town Pasadena, one of my favorite areas. Our first stop was to visit old haunts in the Fashion District with the kids. When we lived in Hollywood, Elijah was about the same age as our little one is now. It was bizarre—and pretty cool—to see him, at 6-foot-3, push our youngest around in a stroller just like I used to push Elijah around the Fashion District in a stroller, years back. What a serious time warp. We ate at Pink’s hot dogs for old-time’s-sake, spent a day at The Getty Museum, shopped at the Rose Bowl Flea Market (my favorite! ), toured our old neighborhood—which has changed quite a bit, yet is so much the same—had cocoa at The Grove, and received a driving tour of historic Venice, CA from Wendy’s friend, Jessie, who has lived in Venice for the last 40 years. I’ve been to Venice many times, but I had no idea that a large part of the city was originally built along canals. Instead of driving to a neighbor’s house, they would canoe. I love it. As for The Getty, I adore it. If you can believe this, I never did visit The Getty when we lived close-by. We even had a friend who was a curator there at the time, yet I still didn't make it. Back then, Isaac once went on a private tour of the museum before it opened. Where was I at the time!? Seriously. It was fantastic. I am awed and inspired. And ready to find a portrait-painting class to take. Know of a good one? We’re back home now, but part of me wants to turn around and head right back to The Getty. If you are ever in Southern California, get yourself there. Don’t miss it. The mechanic repaired the transmission without charge. However, I’m still sad that the fiasco cost us our chance to see Wendy’s show. She has two more shows coming up in New York City next week. Perhaps I can round up a couple of free tickets to give away and send one of you in my stead. All photos are from my Instagram feed—hallelujah for functioning phone cameras! We forgot to pack the big camera on this trip—ack. Have you seen the documentary, Being Elmo? It's fantastic. Very inspirational. If you have a Netflix account, go watch it right now. While I was cooking dinner tonight, Isaac began to enumerate the many reasons why he would have made a great puppeteer. When I insisted it was not too late to become a puppeteer yet, he said, "Okay!" and headed into the other room. After five busy minutes, he came back to the kitchen with a new friend—meet Guidolfo. One tricky thing about having a teenage cook in the house is keeping track of your pans. I pinned this note on Elijah tonight before he headed out to a swim party with his friends. The note didn't make it out of the door, let alone out of the kitchen. Though I got a good laugh out of him, he had it unpinned in 5 seconds flat. It worked though. Elijah didn't forget. My springform pan is now safely tucked away in its cupboard, ready for Elijah's next fat-bomb concoction. There is a housing community nearby that is centered around a working farm, with a restaurant and a coffee shop on the premises as well. It's rather cool. Well, super cool. Even the people who work there are cool. If you ever visit the restaurant, Joe's Farm Grill, make sure to visit the restroom. I can't bring myself to dispel its mysteries, but I'll just say it is the coolest restroom I've ever seen. And bizarre. Think 60s saturday-morning space-adventure. The community was built on the family farm of a local restaurant developer—the Joe of Joe's Farm Grill. When this Joe sent word out on twitter last Saturday that they were opening their groves for u-pick apples, Charlotte and I concocted an apple-centric plan for Father's Day breakfast. I clearly had apple-picking good times on my mind when I got dressed. Charlotte intuited my intentions and picked out clothes to match. When Isaac woke up and staggered into the room to find us in technicolor peasant clothes, he teased, "What's up with you and the russian doll clothing? The two of you look like rainbow refugees." I said, "Hey now. We're going apple picking. What better to wear?" He must have agreed because no sooner had I finished tying my scarf than Isaac trotted out of the closet in a floral shirt, a fedora, and aviator glasses, all fancied up and ready to join us. Here's the best part. When we pulled up to the grove, the man working the scales wore an outfit identitcal to Isaac's: folky shirt, fedora, and aviator glasses to boot. He was entirely too cool to be working a farm. Isaac and I could barely keep a straight face as we greeted him and got directions. I meant to sneak a picture of the two of them, but our camera only had a dribble of juice left in it. It died too soon. Charlotte and I hadn't planned to take pictures of our excursion—that was a bonus that came along with Isaac. It was bright out. And hot. But with the farm being only a mile from our home and apple-picking consuming only a few minutes of our day, I'm sure we'll be doing this more often. They grow everything from peaches, citrus, grapes and apricots to squash, carrots, tomatoes and cucumbers. One day I'm going to track that Joe down and shake his hand. It's inspiring to have such a visionary neighbor, bringing style and humor together with panache. If you ever visit Gilbert, AZ, stop by Joe's Farm Grill or one of his other restaurants, Liberty Market or Joe's Real BBQ. They are hands-down the coolest places in town. If you're interested in coffee, stop by Joe's Roaster Project blog. It looks like he's developing a new commercial machine for coffee roasting. Restaurants, inventions, a community farm. His ideas are big—and all over the place. Last year we harvested one, singular apple from our tiny new twig of an apple tree. We sliced the tiny Anna apple into four pieces and passed it out to the children. It was a precious preview of what was to come; sometimes it's years before you know if you picked a good fruit tree or not. The group consensus was, "Hooray, these little apples are tasty!" This year, both tiny apple trees are covered with fruit. I feel equal pride and pity for their load. They are bent over and moaning. A beautiful ordeal—like an achy pregnant woman approaching her due date. *The Horticultural Scoop: One tree is a green Anna Apple, the other is a Dorsett Golden. Not all trees will cross-pollinate, but these will, allowing us to have two varieties come harvest time. Soon, soon. Are you ready for some cuteness? ...who is tickled pink to watch his dad and teenage brother paint the new sideyard fence. Little Bub started crawling last Sunday. The following day, he began pulling himself to standing and cruising slowly along furniture. Three days later, he climbed up a flight of stairs and halfway back down again. Whoa, Nelly—zero to sixty in no seconds flat. I blame the bouncer. Our little cherub has some serious baby muscles now. The Baileys had a day in the sun—much needed. We dawdled around the Renaissance Festival for a few hours with my sister Julia and her family. Hermione guided us from place to place while Isaac and I juggled the baby between us. Elijah was in a separate world eating frozen cheesecake, making candle keepsakes, practicing alien languages—with a girl. Yep, Elijah brought a girl. I have been repeating this to myself ever since, Elijah brought a girl. Charlotte wants one of everything. In the past, we've picked up bat wings and bendy-dragons for her to play with. This year, we couldn't extract Charlotte from the mega-overpriced, shoulder-sitting-dragon-pets booth to find a reasonable keepsake for her. Good memories will have to suffice this year. Thank you to those of you who have written to see if I was okay. The truth is, I have been overwhelmed the last while and I decided to cut myself some slack. I’m sorry I haven’t chimed in with an update. There have certainly been blog-worthy things going on. The baby has tripled in size and he is guzzling down food like it’s in short supply. Charlotte is dancing a whirlwind through the house and filling my walls and my heart with “I love you, mama” artwork. Elijah is stretching toward the moon and getting closer every day. He is a giant at over 6’1” and growing. Right now, he’s enjoying a break from marching band—we all are—and getting charged up to go at it again in a few months. My home dec fabric collection, Garden District™, is out. I have two new sewing patterns as well. There is also new Nicey Jane™ microfleece, which is irresistibly delicious. Yes, fleece! Think hats, scarves, mittens, blankets, toys. I’m dreaming up some fun projects. I could just proceed from here with new news, but there have been some wonderful things that warrant indexing, and some tough things too: naming the baby and why I haven’t announced his moniker, getting by with no assistant (it’s just a stinky time to train someone fresh when you have a new baby at home), teaching myself to run (go me! ), creating a custom dance costume for Charlotte for Christmas, drawing and painting like mad in order to catch up from a brain-fuzzing pregnancy. The list goes on. Some of this stuff I imagine could be published in a tell-all book one day. There are always bits you don’t want everyone to know, but you so DO want everyone to know; you know? Life is a roller coaster. I try to sing the pretty songs in my blog, but throwing in a croaker now and then should keep it real. I know I’ve said it before, but I’m anxious to get back to this and be in touch. Thanks for hanging in there for me. About a year ago, I overheard Charlotte and her cousin, Jared, both 5, playing 'Harry Potter' around Charlotte's dollhouse. Their figurines were casting spells at each other through the living room window. Expelliarmus was the spell of choice, however their mistaken version was an enthusiastic — Ex-smelly-armpits! Back and forth, they cursed each other for a good half an hour. It was all I could do to keep from giggling and ruining their play with newfound self-consciousness. Come to think of it, smelly armpits can be magical, can't they? As a shield charm. Or for some, as an untraceable weapon. Around here, Halloween has transformed from one magical night of dress-up and free candy to a series of events. Is this the case where you live? I'm still trying to decide if this trend is wonderful or worrysome. (Last year's series of four parties resulted in too much candy and too much fatigue to shuffle into one school week.) This year, we narrowed down our festivities to just two events — Halloween itself — and the best block party ever. Costume-wise, I was magically off the hook this year. Charlotte discovered the Harry Potter robe I made for Elijah years back and opted to be Hermione Granger for Halloween. My workload? I ordered an improved patch for the cloak and a new tie, then hunted down a hair crimper to frizz out her glossy locks — far from my standard Halloween effort (as evidenced here, here, here & here). To top things off, our neighbor turned Charlotte a custom wand on his wood lathe. Perhaps I could have addressed the shoe situation better. When it came time to head out, Charlotte had to pick from pink ballet flats, white church shoes or a wide selection of summer flip flops. I didn't realize she was down to so few shoes. Fortunately, it's still rather warm in Arizona. At least the flip flops weren't lavendar and glittery — though that would have made for a good laugh. This year we met up with my sister, Julia, and her two red ninjas, Adam and John, for a trek through her neighborhood party. Straight out of the movies, this party had pony rides, a merry-go-round of swings, train rides, a rock-climbing wall, a mechanical bull, and at least three or four other simliar attractions. 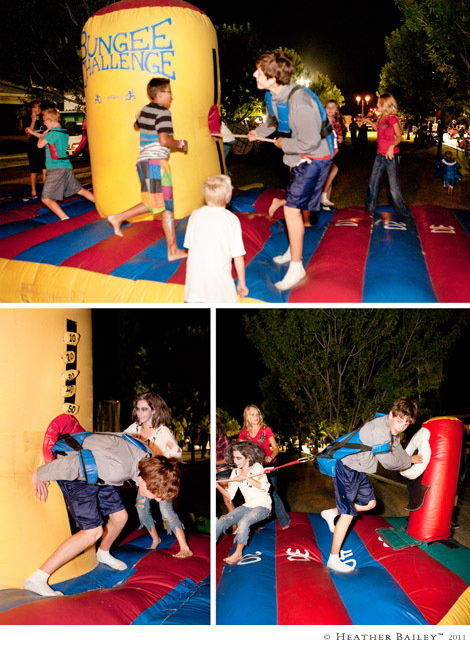 Elijah spent a good part of the night in a tug of war game against a mob of small children. Not only was the entertainment off the charts, but this soiree offered the speediest trick-or-treating I have ever seen. Folding chairs were arranged, shoulder-to-shoulder around the block. When trick-or-treat time came around, the chairs filled with generous witches, zombies, werewolves, and rag dolls. The kids lined up to make their laps for candy — so incredibly efficient and plentiful. No running from house to house, no wasted time waiting at the doorsteps of empty homes. I was mesmerized. So were the children, I’m sure. I'm still sorting out how I feel about the lack of effort involved. Shouldn't the ratio of effort to candy be higher? Charlotte's not too troubled over it, whatever my conclusion may be. She can always cast a spell on me for compliance. "You will let me eat all the candy I want, whenever I want to." Truth is, that little girl cast a spell on me long before she received a wand to whip around. I'm back from 'maternity leave.' I didn't intend to be away for a couple of weeks, but with family in town, my assistant moving into a new job, some replaced stitches, and the usual ruckus that accompanies a third baby, I needed the break. I'm a little behind on big announcements, so watch for new fabric, new patterns, and more. I might need an iPad so I can blog with one hand while I feed the baby. He's a full-time job by himself these days. Of course, I take smooching his feathery head and peachy cheeks rather seriously. Has anyone tried an iPad for typing up posts? I'm excited to get back to it. When the hospital called on August 17th to schedule a C-section for September 3rd, I got off my computer, and walked and walked and walked. Every day, for days. My best shot at avoiding surgery was to go into labor naturally. (My oldest was born by C-section, so the doctor didn’t want me to go full-term at the risk of uterine rupture.) It was over 110º each of those days, so I would head out at 8pm after the sun went down and make laps around the neighborhood in my fluorescent-orange shirt -- the Great Pumpkin. I did it! With four blisters on my left foot and three on my right, our new little bub was born at 1:59pm on Thursday, August 25th. No C-section required -- phew. My feet only stopped aching this week. I had never gone into labor before on my own, so I stayed in bed that morning longer than some might have, timing my contractions on my iPhone (standard clock app, lap function – awesome). Once I could no longer sleep, I started posting my progress on Twitter; it was a fantastic distraction. We got the kids ready for school and called in my mom to make the rounds, then headed out to the hospital. Of course, we had to make a stop at the store for an SD card for our camera. (I wanted photos!) At that point, my contractions were a minute long and three minutes apart, from start to start. At the hospital, when I walked from triage to the delivery room, my doctor announced that I was at a 7 or 8 and everyone at the nursing station stood and clapped, saying “Wow, you’re still walking! ?” I wonder if that’s such a big deal or if they stand and clap for everyone. “You’re dilated to a 1? And you’re still walking! ?” “You’re dilated to a 3? And you’re still walking! ?” Might be a good protocol. I had a big, goofy smile on my face -- between contractions. The staff was baffled by me. Sure, it hurt. Of course! I was just ecstatic that I beat the scheduled surgery and that I’d get to meet my new kiddo. Good thing I was in an excited stupor too, because my doctor had to attend to three emergency situations in the course of my labor. She held off on me a little bit so she could help the other mothers get through their ordeals. After she broke my water, everything went very quickly and the baby was born within the hour. And here he is! The inventory is complete. He’s all here, with all his teensy parts. And everything appears to work as it should: cooing, gooing, squeaking, squawking, spitting, squirting, grinning, grunting. He’s so new and tiny that all of these functions still have us mesmerized. Two days after the baby was born, Isaac and our talented friend, Jared Platt, met up to take pictures. These lovely shots were snapped by Jared. Jared is a professional photographer who travels the U.S. teaching photography workflow and file management to other professionals. A rambling hello and a Happy 4th of July to you. I love me a holiday. I don't always take the day off, but knowing that I could is a relief on its own. Today, my day is a mix. So far, I've flitted between shopping with Charlotte for sillybands, managing a play date with cousins, washing the laundry, photographing a pattern cover, sketching aprons and prepping to-do lists for the week. In another hour we head to Granny's house for a swim party and food, then out for fireworks. A simple celebration works for me -- especially in this heat, with this belly. These days I get winded just walking up the stairs. I tell myself it's a heat/pregnancy/blood-volume thing. It couldn't possibly be my fitness level. I plan to sit. And sip. And sit. It is HOT out there. If you haven't heard, there's a patriotic pack of Trash Ties™ posted in our shop till Labor Day -- with a FREEBIE offer good till July 15th (see latest newsletter). And long Trash Ties are BACK! And on super sale. Just sayin.